Around the Lighthouse you can spot mating mandarin fish and explore the remains of a Japanese WWII landing craft. 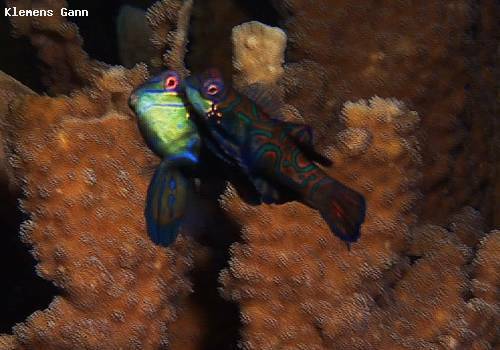 There are few places in the world where you can see mandarinfish, but Malapascua has the honor to be one of the place where mating mandarinfish are common. Lighthouse is often dived in the late afternoon, where the rare and psychedelic mandarin fish are virtually guaranteed. Dusk is a time most people rarely dive. However, it is one of the best times to observe marine life because of the increased feeding and mating activity. Come and see the exotic mating dance of the male and his adoring females. At full moon we also see coral spawning as well as other marine life mating. We regularly see seahorses, scribbled and banded pipefish, juvenile sweetlips, banded sea snakes, hermit crabs, and many varieties of shrimp. As day turns into night you should start to catch some interesting nudibranchs and a variety of cephalopods - reef squid, bobtail squid, starry night octopus, the occasional blue-ringed octopus and cuttlefish. Also near this sight is a World War II wreck. The wreck at Lighthouse was a Japanese World War II landing craft. It was bombed just before landing with a large shipment of cement destined for a gun emplacement. The wreck is in very shallow water - 3m average - and is broken up with the hull in two pieces. The rocks that you will see are actually bags of cement! Things that you can see around the wreck include yellow-tailed barracuda, hermit crabs, octopus, pipefish, juvenile harlequin sweetlips, and banded sea snakes. Nearby is Lighthouse West - easily reached from the wreck to see abundant mandarinfish and seahorses. There are many places in the Philippines where you can observe mandarinfish. But one of the best dive sites for close observation of mating behavior is the Lighthouse at Malapascua Island. Here you will see mating mandarinfish in their fulldisplay! In the late afternoon, short before sunset is the time where they show they most active mating behavior, with the males chasing the psychedelic colored femal mandarin fish. Dusk is also the best time to observe other marine life here like resident seahorses and other exotic creatures.